Toyota was known in the 80’s for its continuous improvement methods and the empowerment of employees to identify deficits and provide suggestions. Although Deming and the US manufacturing complex during the 40’s for support of WWII invented continuous improvement we soon forgot after the war. 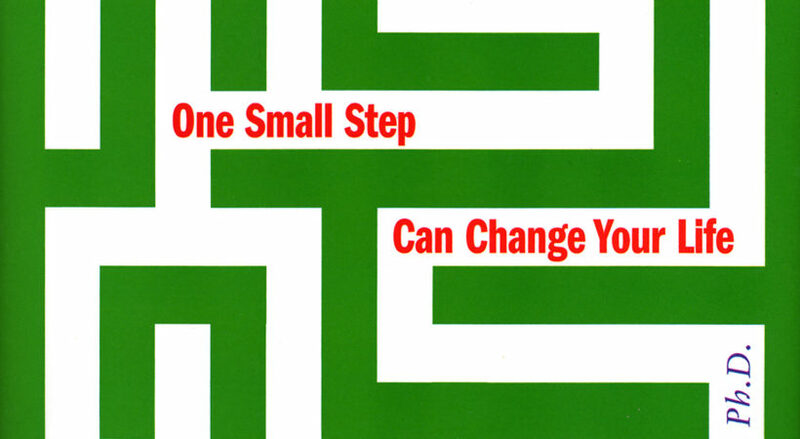 One small step is the thought behind Kaizen and Maurer applies continuous improvement to solving our own life problems. Maurer presents a simple concept, as a psychologist he has been able to apply continuous improvement to many of his patients. For instance, patients are often told to exercise but are embarrassed when they do not have the time, or do not have the energy, or it is just too difficult. One continuous improvement suggestion is to march in place in front of the TV for 30-60 seconds a day, eventually it becomes habit and the time increases more and more. Small incremental changes add up over time. Ask Small Questions – the brain loves questions, this is why children are asked “Would this make mom happy?” rather than “This does not make me happy.” The brain can be conditioned through questioning, and habits created. Ask questions such as “What is one small step I could take towards reaching my goal?”, “What is one thing I could do to drink more water?” Although small, the effects are compounding. Think Small Thoughts – this technique concentrates on mind sculpting (and I think virtual reality will aid this greatly). In seconds a day, think how an action would feel. For example, when asking for a raise: think how the chair feels, how your voice sounds in your head, how your boss reacts, the air in the room. Visualizing like you are there makes neural connections, don’t just watch yourself but imagine it’s happening to you. Take Small Actions – just like it says, small items. If you are on a diet, take one bite of a meal and discard it. If you are trying to get active, get a hand grip and squeeze it while watching TV. Do not jump into things feet first, but ease in. It is like weaning off smoking, one less cigarette a day adds up. Solve Small Problems – Identify blind spots, if something feels like it is a problem than it more than likely is. Small problems add up and become big compounding problems. If something in your gut throws off alarms, fix it! Bestow Small Rewards – Rewards need to be meaningful and aligned with the accomplishment. Large monetary awards can alienate employees, and cause malicious behavior. Reward yourself in small increments, or break a task into small rewards. If quitting smoking, reward yourself for resisting an urge. Identify Small Moments – Look for bright spots, if trying to cure smallpox look for those who don’t get it and figure out what they are doing differently. Small discrepancies can lead to big payoffs. If you dislike your job, notice one thing you do like and try to find a career that expounds upon that item. One small step was truly a quick, enjoyable read. As any self-help book it can be hokey at times, but it served as a reminder that in our hectic lives small things really do add up. I am encourage to find one small step or two and work on my strengths and weaknesses. One small step helped me write this blog article.